Frozen & Ready to Enjoy! Now that the summer heat is in full effect here in Florida, I have been craving something cold and refreshing during the day. I used to turn to ice cream, but the high calories and fat content add up pretty quickly. Sorbet has always been a favorite of mine, so I decided to make my own with fruits and a surprising ingredient, coconut oil. Coconut oil is a healthy fat that is made up of medium chain triglycerides which are used directly through the body for energy – talk about a boosted sorbet! Place strawberries, bananas, and coconut oil into the blender. Pulse until completely blended. If mixture is too thick, add in ¼ cup water at a time and continue to blend. Once desired consistency is achieved, taste mixture to see if Stevia should be added. Pour sorbet mixture into separate ramekins and freeze for approximately 2 to 3 hours. Top with additional fresh fruit or whipped topping and enjoy! 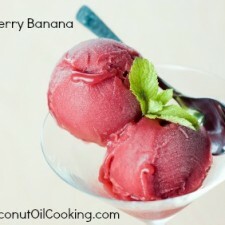 Adding Stevia or desired sweetener of your choice is completely optional, depending on how sweet you like your sorbet. 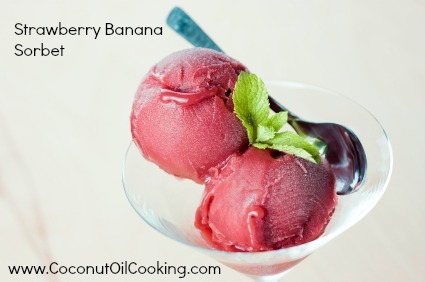 Sometimes the fruit contains just the right amount of sweetness and makes for a perfect sorbet. If you do like ice cream, try Jen’s healthy alternative with this chocolate chip cookie dough frozen yogurt recipe. What’s your favorite treat to make for summer?